Another project on the workbench at the moment. I know the 458 is nearing completion, and the 495 is sitting there awaiting some attention, but a new toy has prompted me to try out a new loco. This time, another DSER tank in GSR guise. Class 423 a 2-4-0T used on the commuter line however they were not highly regarded by the GSR, their comment being "these engines being obsolete in every way. They are slow and high in coal consumption". Not withstanding these comments they ran from 1891 to 1955, so they can't have been all that bad. They also saw service on the Cork - Bandon line, so conceivably could be seen on any Irish layout. Nice tank engine with good proportions and large driving wheels for their size and proposed use on the commuter network. The difference with this loco is that it has been designed for cutting on the CNC Mill. I mentioned toy above, but this cannot really be considered a toy - the learning curve is quite steep and the software requirements are considerable. 2/3D design Package (AutoCad or similar), Conversion software to generate G-Code (MeshCAM in this instance) and something to drive the servos on the mill (Mach 3 for this mill). Each element has a hefty learning curve, and I have only scratched the surface! Anyway, where we have got to is a drawing kindly supplied by the good people at the IRRS (and they are genuinely a very help group of people), was developed as a CAD drawing. From this drawing parts were extracted into a cutting plan - sample below of the frames. 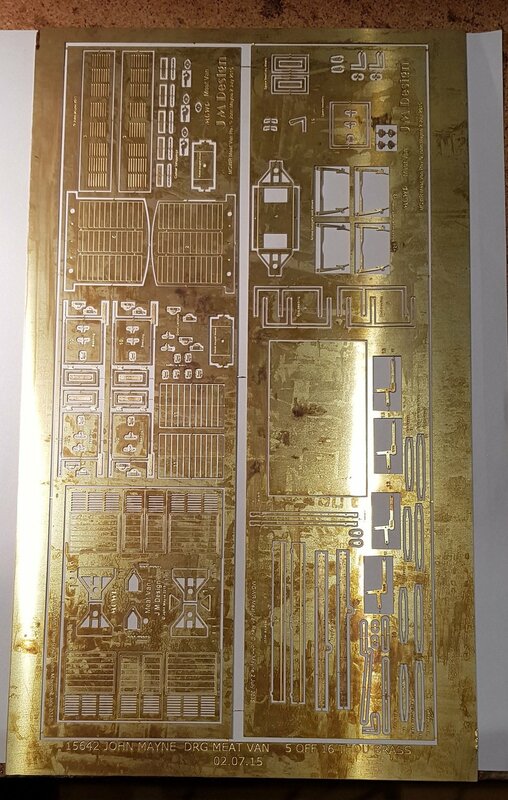 So from CAD drawing to G-Code and through the mill using 0.5mm Brass Sheet we get this. I'm really impressed at how good the CNC cuts and how precise the detail is. Frame spaces were also cut out using the mill which helps to ensure accurate spacing. 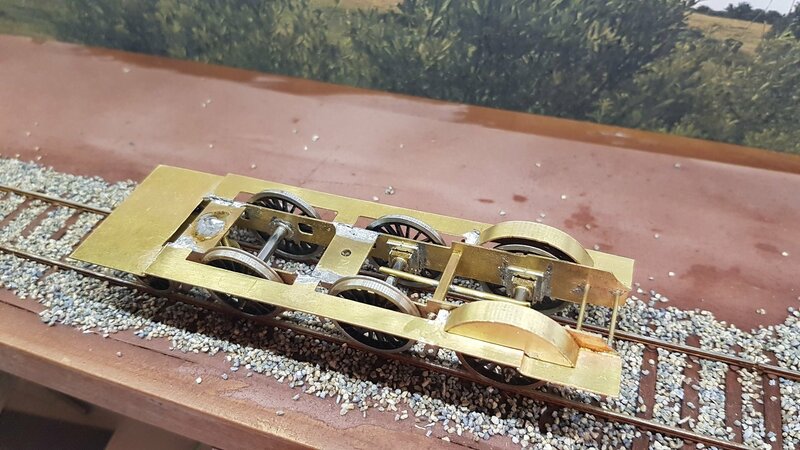 If you looked at my Class 458 build I go through the installation of hornblocks and setting the axle spacing, so rather than repeating that here I will jump to the rolling chassis point. 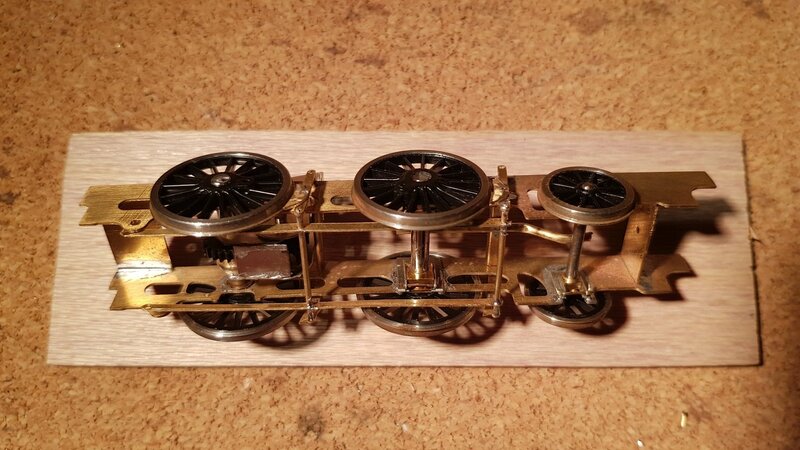 On this model as a simple three axle loco, the rear axle is fixed for the motor and the two front axles are compensated. Rather than building the complex bar and spacer arrangement as per the 458, I decided to simply bend some 1.5mm tube to the relevant shape to set the level of the chassis while allowing both axles to flex. Much easier to tweak the frame levels this way. Next up, brakes and gearbox. Again brake blocks and hangars were cut using the CNC. I need to tidy up the brake rods at the rear and tie them into a faux crank assembly. Next up, footplate. This was constructed in the same way as the 458. All of this brings us to a rather nice rolling chassis. Gearbox is a High Level Roadrunner +. Levels will need to be set for the motor once I get a boiler in place. Next up was the body, so back to the drawing to create a cut sheet for the CNC. Once again translated to G-Code and we start milling. The brass sheet is stuck down to the MDF with spray adhesive. The tabs between pieces are needed to keep everything in place while cutting. 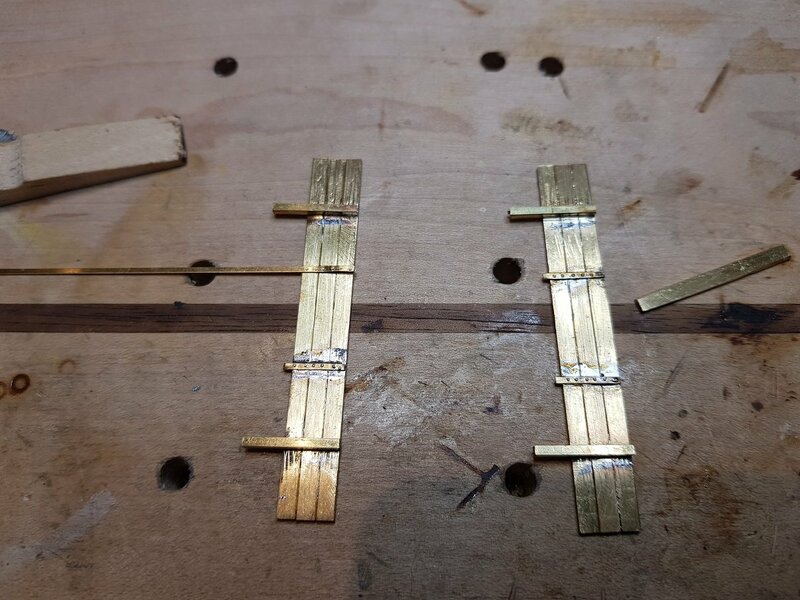 An earlier attempt resulted in smaller bits flying around the workshop - not so good, and impossible to find. 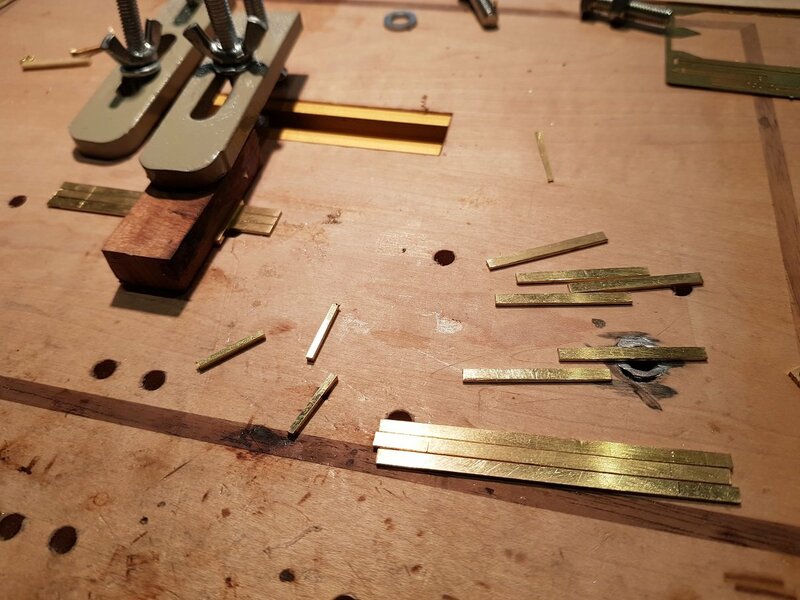 This leaves the parts in a fret arrangement similar to etches, however the tabs are full thickness so they need to be cut out and filed back to sharpen the edges. That's all for now. Off to the Raheny show tomorrow! It would be interesting to work out the comparative costs of producing the parts by CNC milling and photo engraving. I guess the main advantage for both types is the ability to repeat once the CAD file is converted to a CNC or Photo Tool and it saves time involved if forming the part by hand and minimises the risk of error in marking out. The DSER 2-4-2Ts were basically a development of the earlier 2-4-0Ts with a bunker and trailing axle to increase coal capacity. 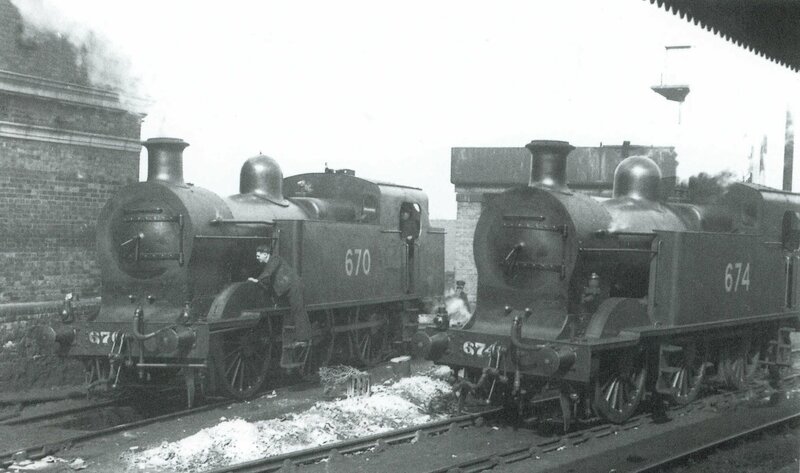 The main mystery is why the remaining 2-4-0Ts were not rebuilt into 2-4-2Ts as their coal capacity basically restricted them to short distance work to Dun-Laoire and Dalkey. Inchacore did not seem to like DSER locos especially the passenger tanks! There is a good account of the late Jack O'Neill's 1st encounter as a fireman with 433 an ex-DSER tank in "A Decade of Steam" he immediately gets off on the wrong foot with the driver by insulting "his engine" by calling it a yoke. One of a number of firemen transferred to Grand Canal Street, redundant as a result of the introduction of AEC railcars on Dublin-Waterford passenger services, no doubt not too happy as result of the transfer form Waterford and suburban passenger work with its frequent stops and starts and cramped cab of a tank loco. Jack seems to have ended his shift impressed with 433 smooth running, free-steaming, haulage ability and speed. Lifting a seven bogie Boat Train off Dun-Laoire Pier and skipping through Blackrock at 50mph. He seems to have enjoyed his time at Grand Canal St as a fireman, his only complaint about the loco was the extreme heat in the cab in Summer. A fascinating project that deserves every success. The variety of computer controlled hardware and it's lowering cost has vast potential for modellers, although the main stumbling block is learning CAD, I think. Master that and the ability to create your own kit is eminently possible. 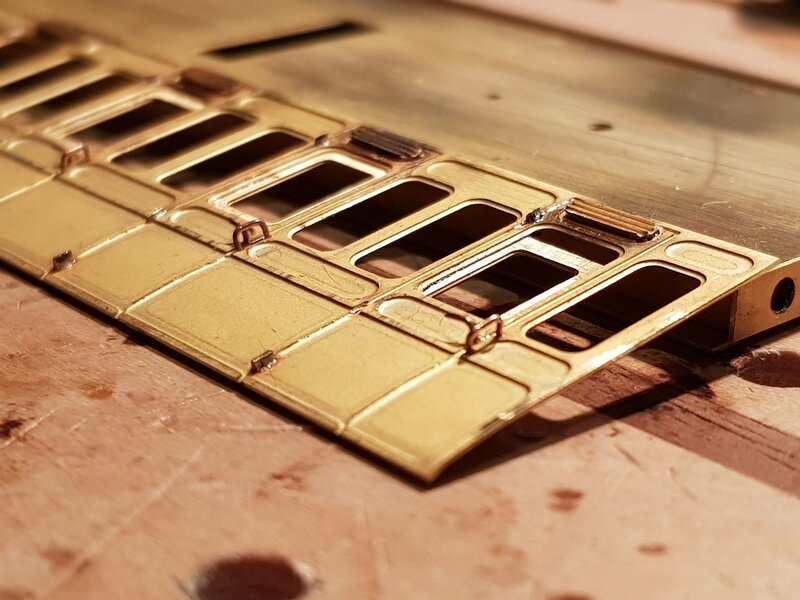 The difference between hand drawn, photo-etched brass kits and computer drawn ones is noticeable in the greater accuracy of the latter. It seems to me that things fit together so much better these days and I'm sure it is not just down to my own skills evolving. 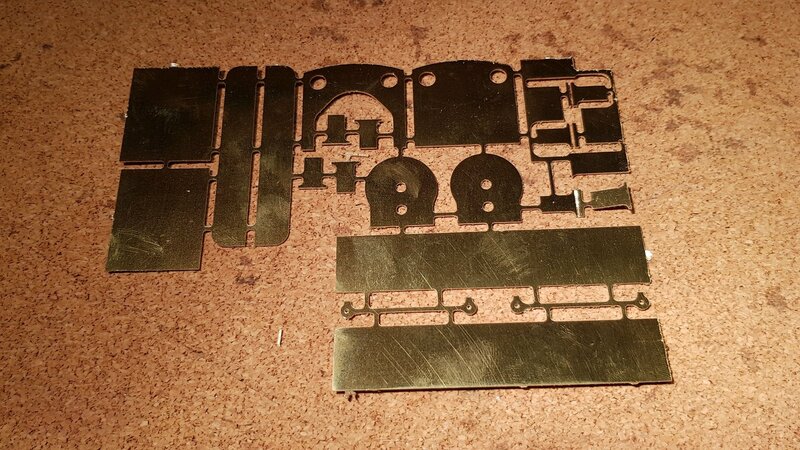 I like the idea of being able to create a one off 'kit', where all the flat/non cast parts are drawn and etched, rather than having to go through the tedious process of cutting individual pieces from sheet metal. I know a couple of modellers who now do this. Having learnt CAD, they draw out their chosen items and send the computer file to a professional etcher. The cost of the latter is relatively cheap; design costs however run into four figures if you want somebody to do it for you. Maybe one day, we will be able to 'ask Alexa' (other smart speaker devices also exist) to 'make me a drawing of an Achilles Bogie'. However, guess by then, Alexa could probably rustle up a 3D printed version, though that would take away all the fun of building it. 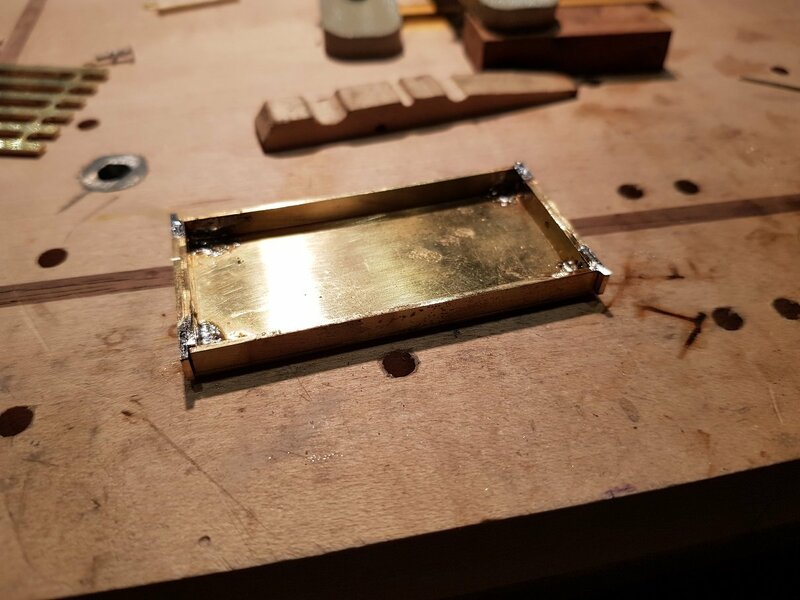 I reckon etching would be far more economical on time for mass production, there is more prep work in making the etching tooling & UV exposure but once done one could clatter out etches in quantity in the same time a CNC machine would cut one. Thanks for the comments guys; they are much appreciated. The DSER 2-4-2Ts were basically a development of the earlier 2-4-0Ts with a bunker and trailing axle to increase coal capacity. This is very evident from the drawings and photos of the locos. From the photos, it looks that the way the rear tanks were constructed the footplate would be quite cramped, so I can have some sympathy for the crew in operating on the stop / start schedule on commuter line. 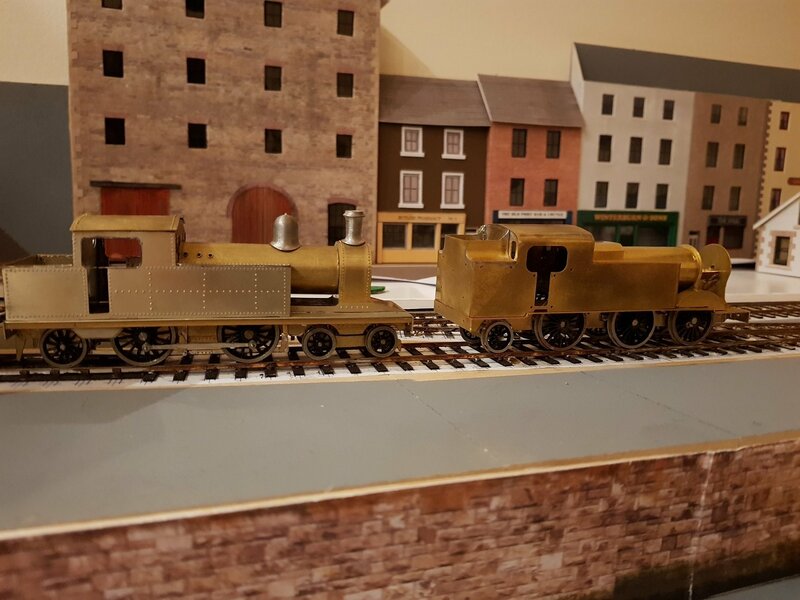 My plan was to complete the 423, learn from the experience, tweak the drawings slightly and build 428 (433 is a member of this class) which seemed like a logical next step and I am quite fond of the 2-4-2T class. although the main stumbling block is learning CAD, I think. Master that and the ability to create your own kit is eminently possible. I have been using 2D CAD for a number of years for the "real" job so creating plans for cutting was quite straight forward. I do not underestimate the learning curve here as I had to do it at one point also. What I can recommend is a night course in one of the local technical colleges which will get you to a relatively competent level within a short time - this is how I learned as I needed for work. To help practice, it should be possible to get an older copy of AutoCAD lite for small money. I am trying to get a copy of 3D AutoCAD (one of the older versions with disks and licence) so I can continue with the 3D learning I did with the 495 project. 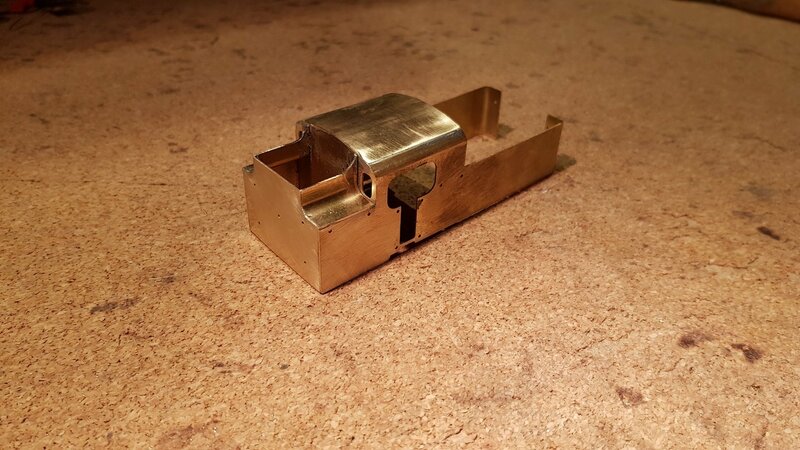 What I have found is that the CAM and CNC software is quite complex and while I have got a basic knowledge to allow me to cut basic parts, I would like to fully exploit the benefits of the CNC mill, including some 3D parts. I have no experience in etching, so cannot comment. Milling can take quite an amount of time - a single pass on the cut out above took about 50 mins, and due to settings I needed to re-set the height of the cutter to ensure I cut through the sheet, and run a second pass. 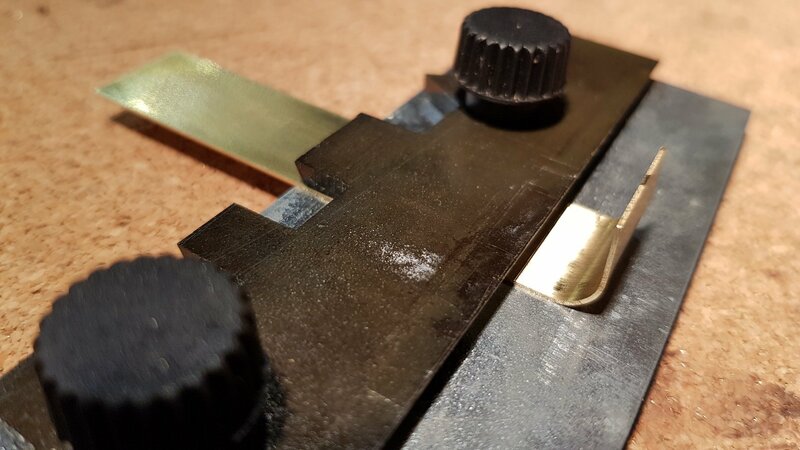 So all tolled, it was the better part of 2 hours cutting - I don't know how long etching takes, but I'm quite happy as it is faster and more accurate than cutting by hand. For me, it means I can sit down at the bench and assemble the parts knowing they fit, or should do if I drew it correctly. It also means, I can make repeat models knowing they will be of the same standard. However, there are lots more locos in the GSR fleet which could be built instead of repeats!?! 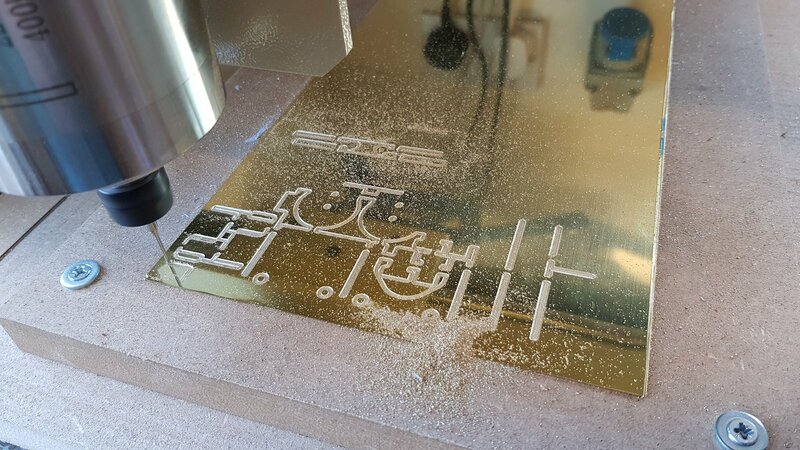 Say to etch the sheet you have CNC'ed above would take about 1 hour in .5mm brass, but up to 10 separate sheets (dependant on size of etching tank, my tank is small and takes 4 sheets) can be processed at a time, and these sheets could have 4 kits on them! Quite a bit since i updated this page. Tanks were formed with the curves front and rear. Tops added and excess trimmed off. Given the size of the tanks the cab front was trimmed to meet the top of the tanks rather than cutting into the tanks. Tanks are rather large on this locomotive and fill out fully to the sides of the footplate. A trim detail at the bottom of the tank finishes them nicely to the footplate. The difference in cab width and the tanks is quite pronounced. 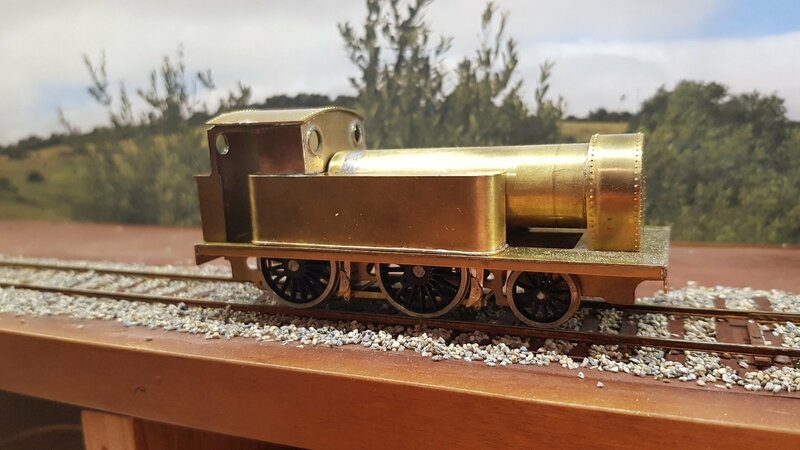 The boiler and smokebox were then formed and mated up to the body. Some fettling needed to get the tanks and boiler to co-ordinate together. A trim plate over the boiler at the cab front is needed to close the joint - it is quite distinctive. Roof will be need to re-done as it's a fraction too small. Fixing points are located at rear holding the bunker and cab, front holding down the smoke box, and front sides of the tanks. Generally holds things in place and allows access for maintenance. A little teaser for the next loco on the bench. 0-6-2T DSER loco with distinctive rear tanks and bunker. Lovely stuff! Always really interesting to see how others make things. These locomotives 670 - 674 were built by the GSR for the ex DSER line to handle commuter traffic between Greystones and Dublin. From all accounts they were complex machines with inclined valves and limited access for maintenance and repairs. Constructed in 1933 with Z-type boilers and mainly of welded construction resulting in smoother lines. Drawing was developed again from sketches generously provided by IIRS and developed into a cut drawing for the CNC Mill. Parts cut out and construction commenced on the cab area first as this is of great interest due to all the curves. 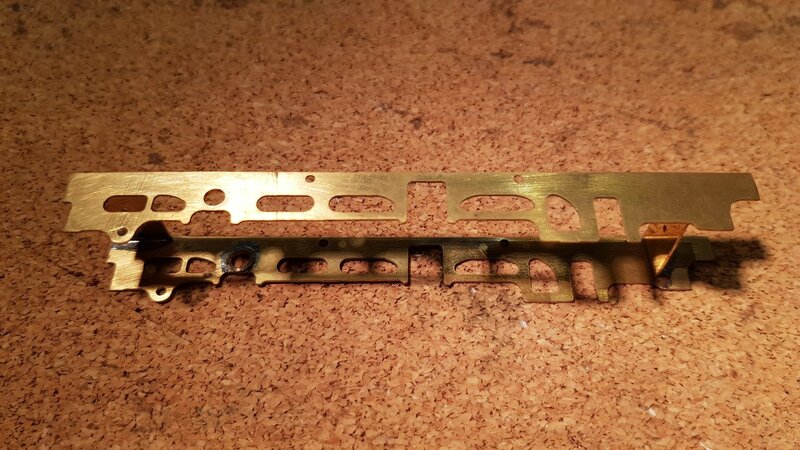 The split level footplate led to a different approach - rather than a single footplate with a hole cut out, profiled tabs were cut which were then fixed to the frames. This allowed both the split levels, but also to retain the distinctive high frames at the smokebox area. Compensated chassis again with fixed rear axle for motor and gearbox, with middle and front axles in high level hornblocks. Compensated beam between font and middle axle. Trailing bogey is carried in a pony truck cut on the mill and bent into shape. What is nice about these locos is the smoke box; large with a curved front plate dropping down between the high frames. 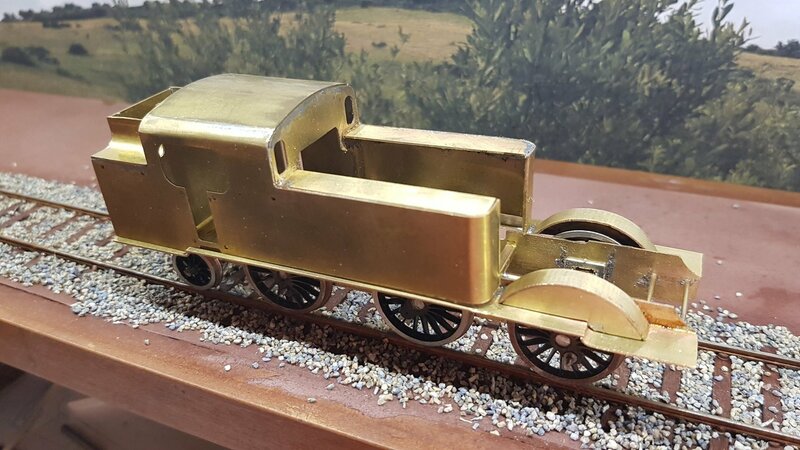 Smoke box formers were created, curved, drilled and fixed. Boiler barrel is 18mm pipe with a captive bolt to thread into the smoke box. 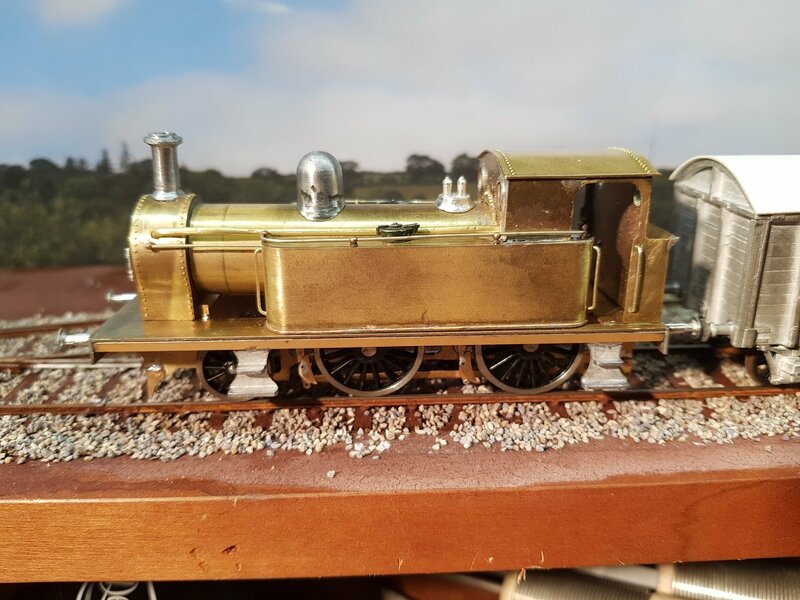 Belpaire section of the boiler was formed and soldered to the cab - still need to fix boiler barrel to belpaire section, however that may be a simple tapered slip connection which will facilitate dismantling for painting and maintenance. What is interesting is the relative size of locomotives. Not having actual prototypes available to compare we are left with comparing statistic in books, however, you can read as many books as you like, but when you see locos on the track you start to get an idea. 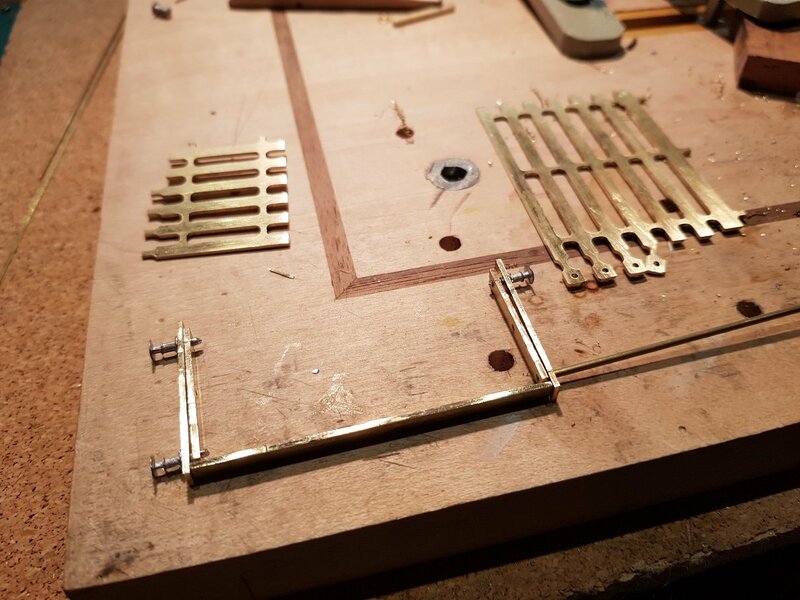 That's called a 'Hold n Fold' tool, looks like ken has inverted the top clamp and used a round bar held by the clamp to do the fold over- Eileen's Emporium stock them and they come in different sizes. As noted by Eoin above, it is a hold & fold tool with the top inverted to act as a backstop to hold a round bar to allow bending. The version I have is the RP Toolz Etch Bending Tool "Hold n Fold" - 18cm long. 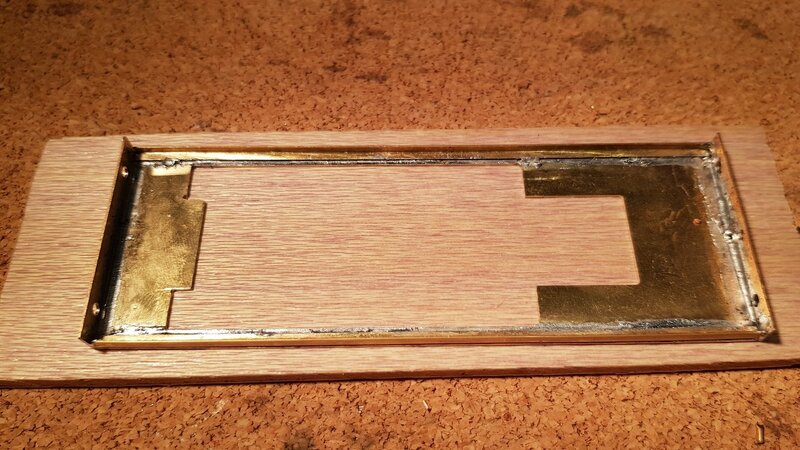 Cost me £33.50 via e-bay but it is an excellent tool and much needed when working in brass. Got back to doing some work on 423. New roof created which fits better than the last one. Quite a lot of detailing done which takes a considerable amount of time but does start to finish off the loco. 423 with an SSM convertible wagon for company! Handrails and knobs were from another partial kit bought some time ago on e-bay, as were the tank fillers, steps, dome and chimney. Handrails knobs on the sides of the tanks are not fixed yet which allows the handrail to be removed if needed for painting and finishing. Chimney was shortened, re-joined and turned on the minidrill to smooth. 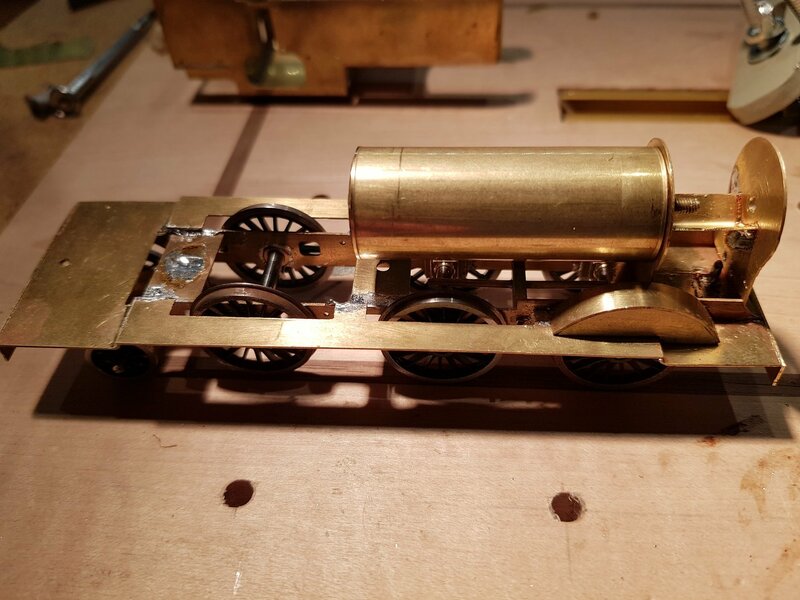 Safety valves, smokebox door and buffers were supplied by @Mayner, of these parts. Slight incident when heating the handrail on the smokebox door - bit too much heat causing a small hole. I can fill this later when painting rather than trying to do something with it now. Working on the chassis in parallel so pick-ups on drivers only at present; pick-ups needed on leading wheels. Motor in and wiring almost complete. Guard irons fitted front and rear. 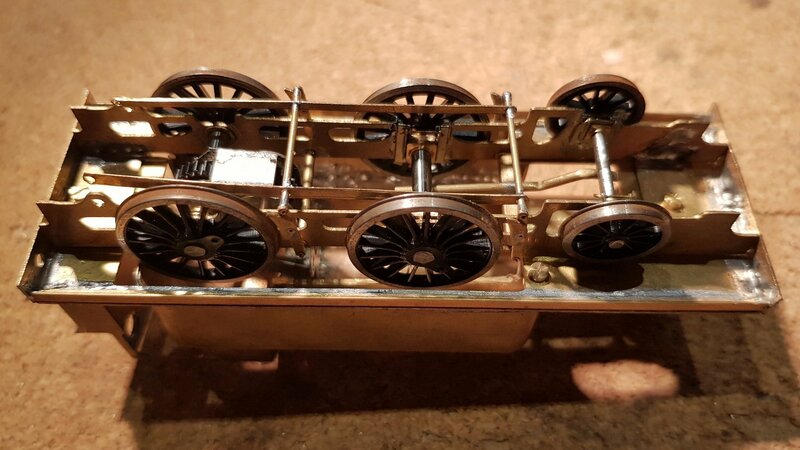 Coupling rods to be fitted once chassis is motorised - I find it easier to work without having to repeatedly disconnect them for access. Still a lot more to do but it's starting to come together rather nicely. Certainly is Ken - and now I have my GSR locos book, I can follow the background to your growing fleet too. A fine collection, so keep the posts coming. The later DWWR/DSER 2-4-0 & 2-4-2T had a business line appearance with high pitched boilers and large side tanks very little of the dainty finesse of 458 Class 4-4-2T about them. It almost looks like some one in Inchacore or possibly an ex-DSER draftsman had a hand in designing the 670 Class 0-6-2T, which was basically a superheated passenger tank version of a J15. Many thanks for the comments guys - they are much appreciated. Finally reached the end of the construction phase on 423 - it has taken just over 2 months from cutting of frames to this point. Latest work included fitting of springs for front axle, draw hook and vacuum hoses. Box section and PB wire were added to simulate sand pipes. Pick ups and wiring for motor are complete and after much fettling we have pick up from all axles. 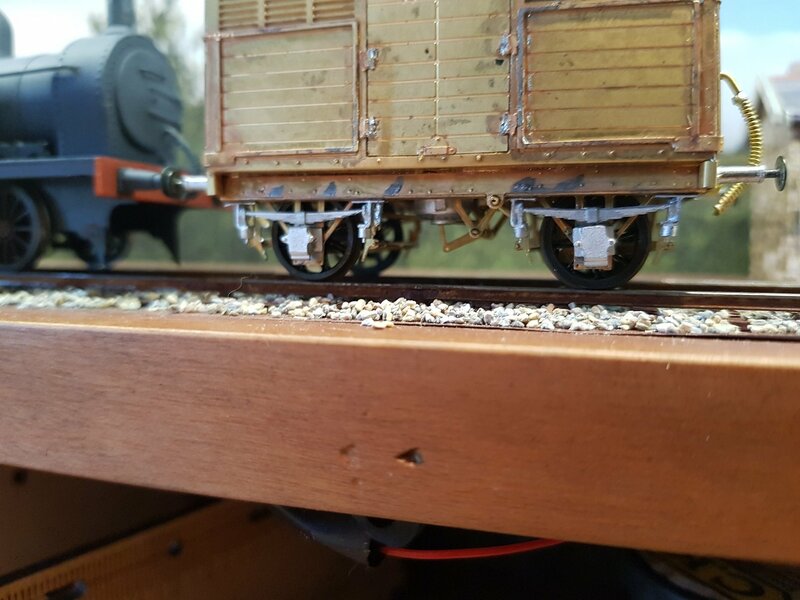 Wheels quartered and coupling rods fitted followed by a test run to fine tune the quartering. Finally we have motion!! I posted here at some stage that Precision Paints do the accurate dark grey. However, I realised tonight by reading an entirely unrelated email I had sent that I should have said Phoenix Paints...... possibly Roderick of 00 Works may have some too. 423 has been painted, however before finishing the weathering I want to stencil the numbers on, however I need to get some yellow ink to blend with the white I have to create the light yellow normally used. While waiting, I decided to move over to building some kits. Those lovely kits from @Mayner were not going to make themselves. so I decided to get stuck into the Fish Van. Really nice kit and very detailed. 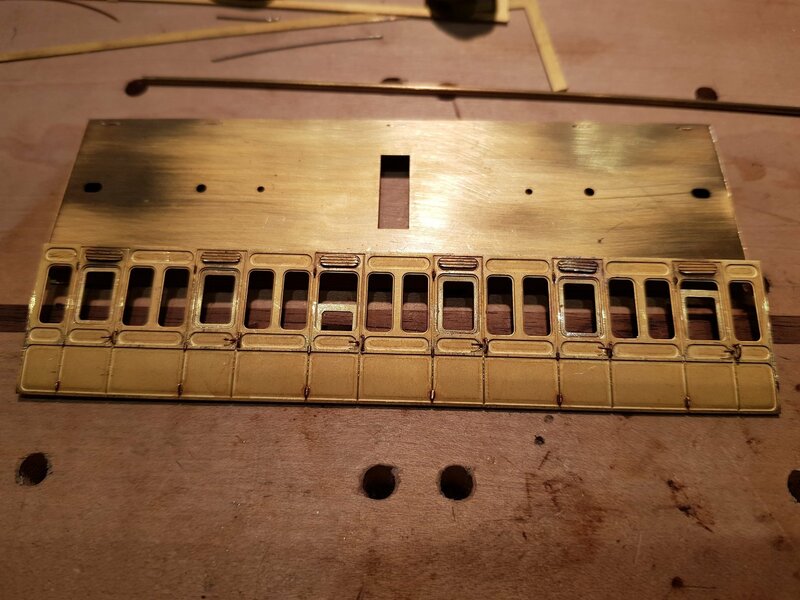 Started by cleaning up the fret as there was a lot of tarnishing from the etching process, however this did not clean up very well as will be seen from the finished van. However despite the tarnishing it did solder together very well. It will be painted anyway, so will not really make much difference. 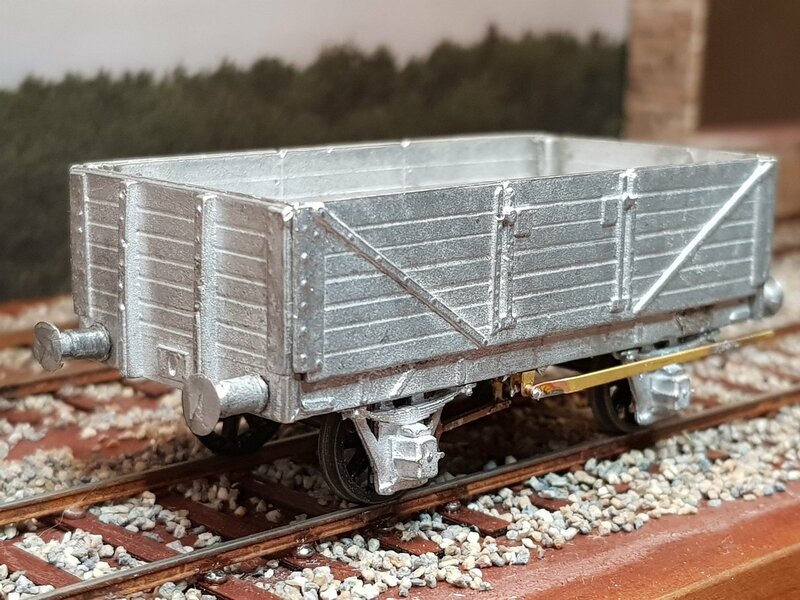 The detail for the underframes and brakes is very good, however quite fiddly, particularly setting up in 21mm and compensated - there is very little room left for all other elements. Thoroughly enjoyable build and came together in a day. 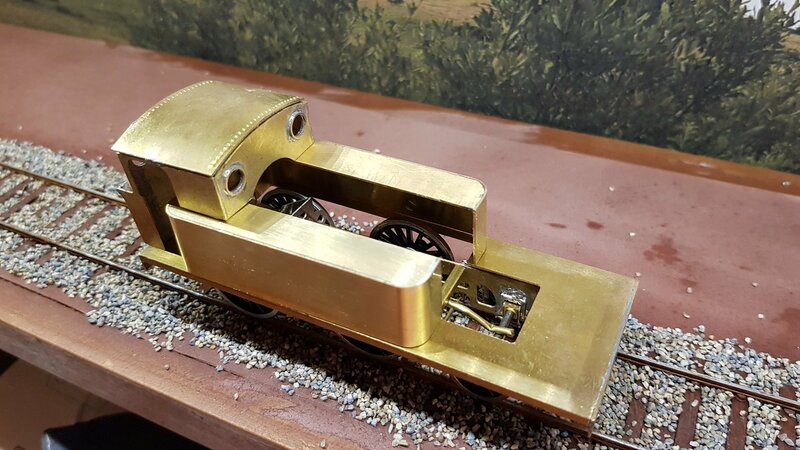 It will add nicely to the layout of Irish rolling stock. A quick snap of 423 with the van. Paint job on the loco is coming together rather nicely. 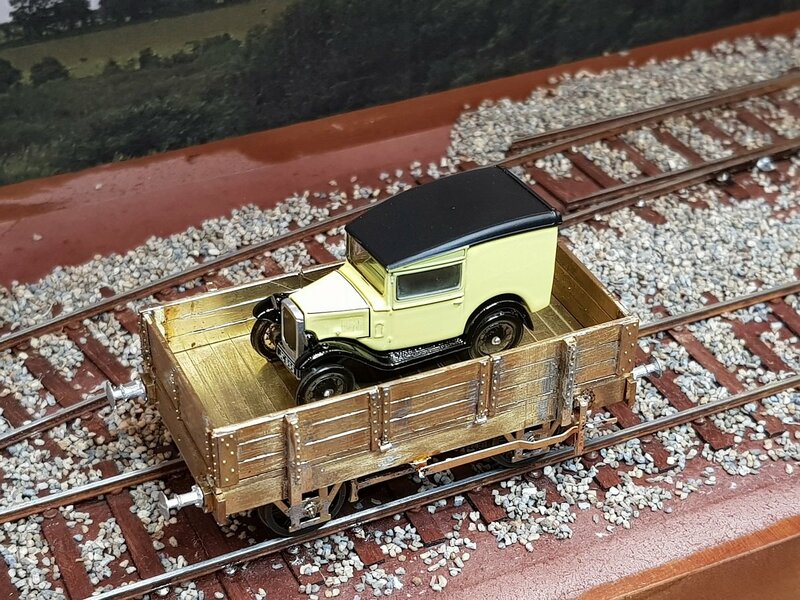 Given that the van kit came together so well, I decided to have a go with the Worsley Works kit of a GSWR 3 six wheeler. 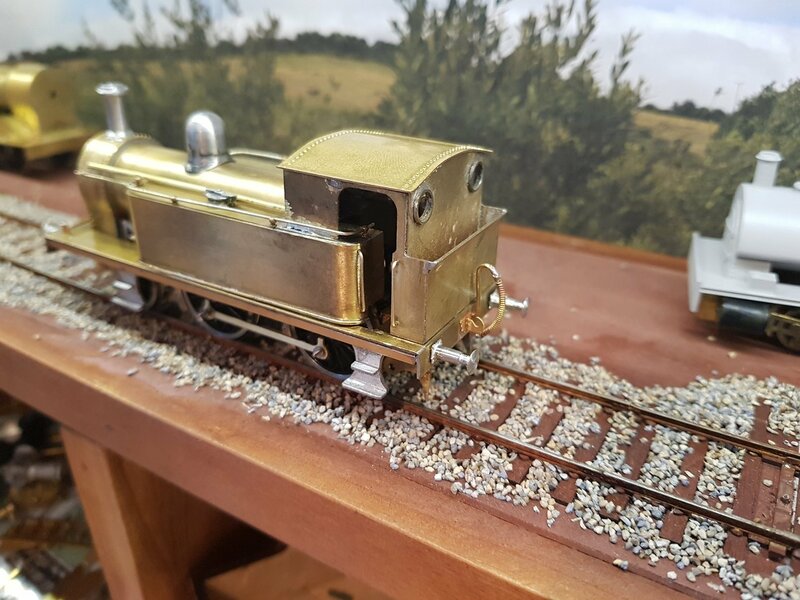 These kits are little more that the basic sides and ends, as it has the sides, underframes, roof, ends and six wheel chassis frets included. They are much more detailed that I was expecting with separate etches for the ventilators over the doors, pilot holes for hinges, grab handles and door handles. So while the sides were in the fret, I added the ventilators, door windows, and profiled the side. Hinges were then added, with door and grab handles inserted (well one side anyway - it's a bit fiddly). 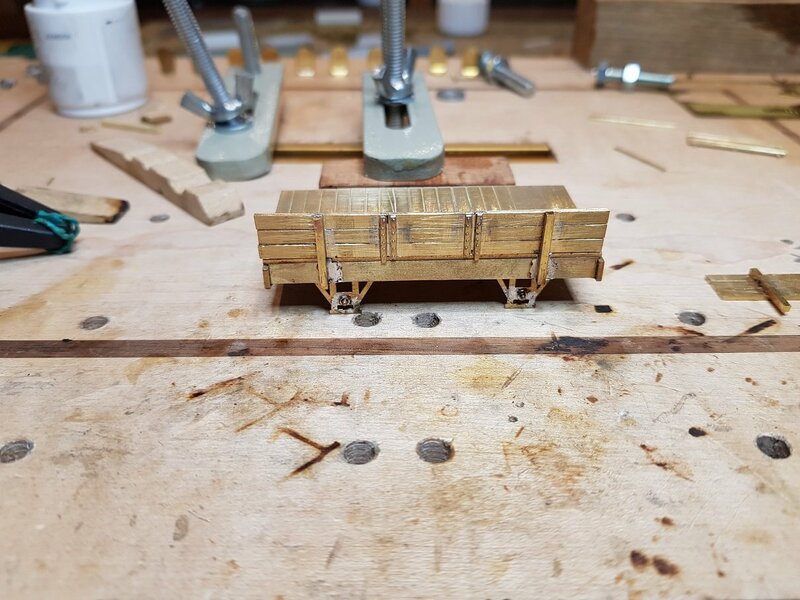 The underframes and buffer beams were added to the coach floor in preparation for the chassis. 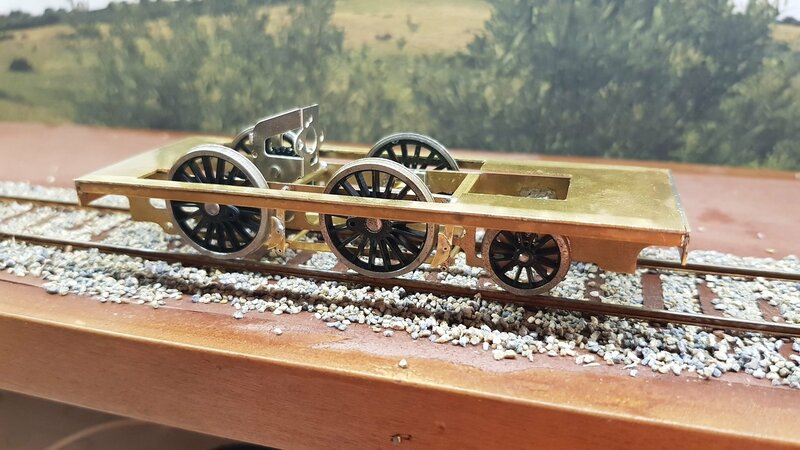 The loco and wagon look great. 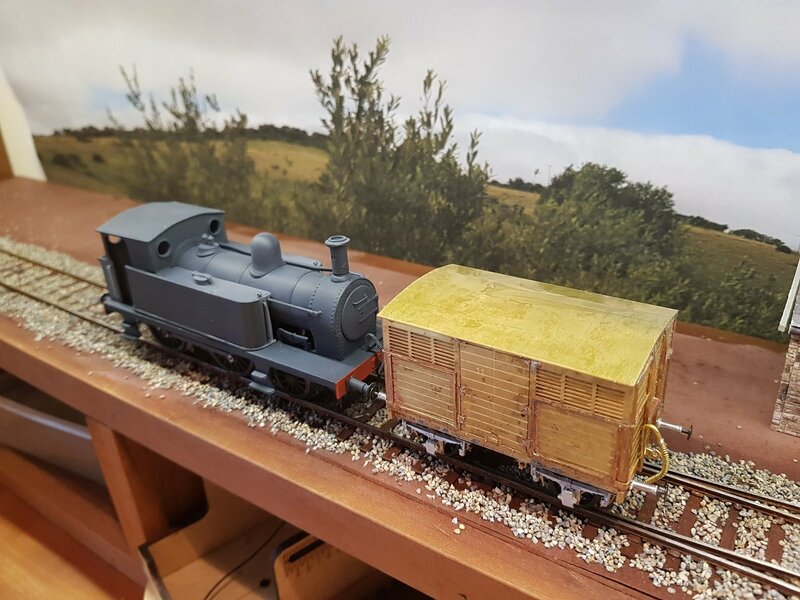 The Worsley kit takes a lot of work, the one i am doing has a roof that's too small, so i had to make my own. KMCE, I take my hat off to you. 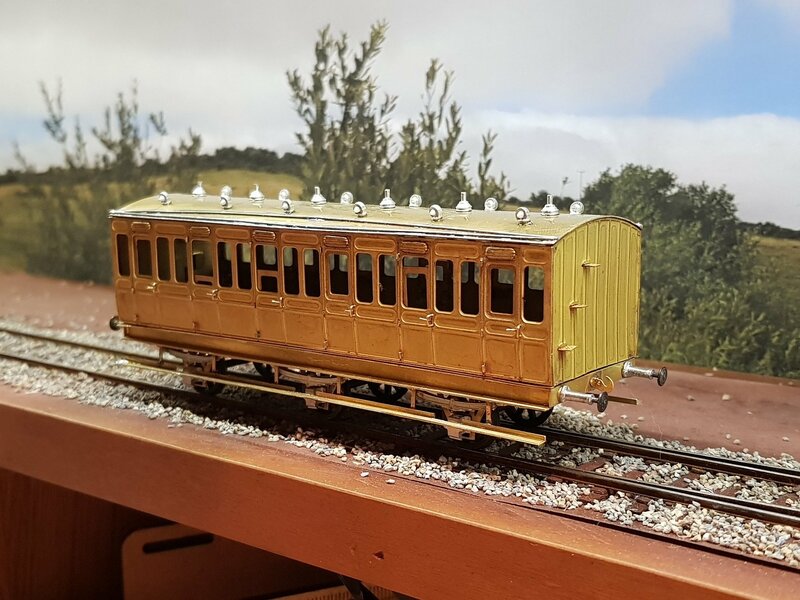 Scratchbuilt GSR locos, the van, and now GSWR carriages. It's things like this which open up new areas (eras!) of the whole hobby. Not to mention the outstanding quality of workmanship and output! Superb stuff, and keep 'em coming. 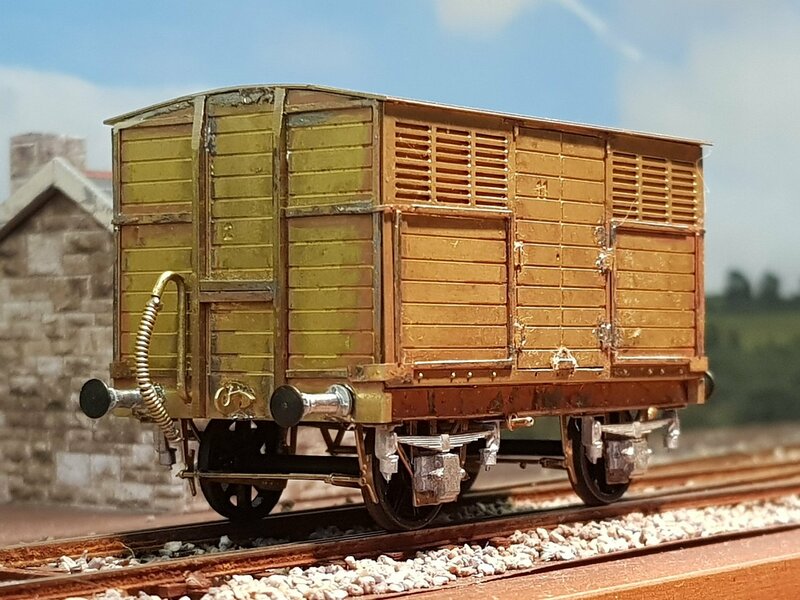 Nice to see the MGWR van assembled with the alternative doors! I will post you a set of end castings & handbrake wheels. I haven't heard back from Dart Castings on whether they have these particular castings in stock. 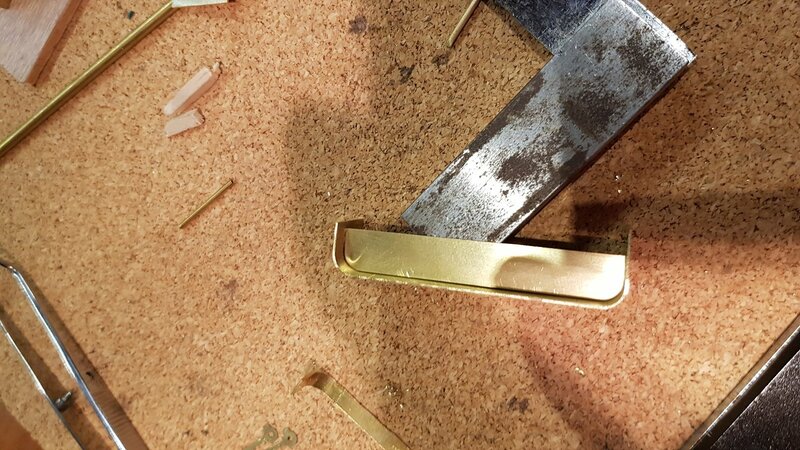 The amount of tarnish is a bit odd on a fret straight from the engravers, possibly rushing with pre-Christmas orders. Those 6 compt GSWR 3rds did not exactly have a lot of leg room, most were withdrawn/converted to turf-wagons during the Emergency. Many thanks for the comments - very much appreciated. 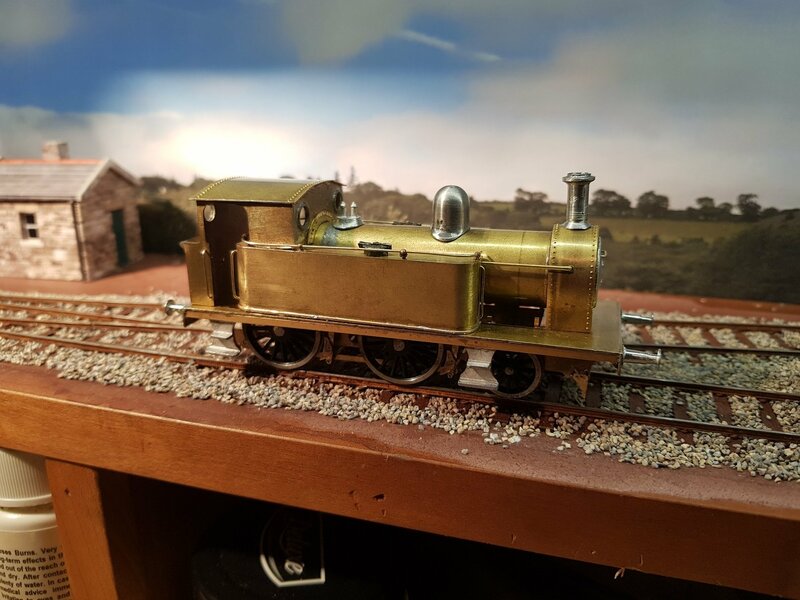 The Worsley kit takes a lot of work, the one i am doing has a roof that's too small, so i had to mak﻿e my own. Agreed, there is a good bit of (enjoyable) work, and I have not checked the roof for fit at this stage - hopefully it will be OK, as there is rain water strips detailled on it which are very nice. I am kinda partial to the DSER side of things and there does not appear to be much stuff modelled that I have seen, so it seemed logical to start with these when scratchbuilding? I will post you a set of end castings & handbrake wheels. Very kind offer and I will definitely take you up on the handbrake wheels. Could I trouble you for two sets rather than the end casings, as the horse box will also need them?? 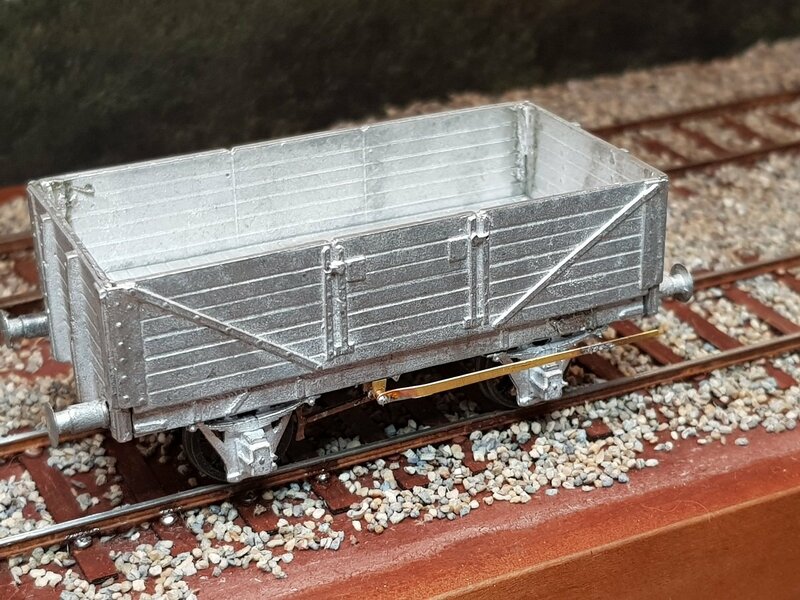 In the absence of the end castings I decided to scratch build frames to match the photo of the van with the later doors which appears to have a simple H frame. Really nice model to build and it looks well. Hope fully it will improve with a coat of paint. Possibly the Maroon mentioned in your instructions, or perhaps late GSR light grey for goods vehicles? If you’re in CIE times, they started painting them plain green. The only time I ever saw one though, the livery could best be described as 97% brake dust weathering, 3% badly faded green! The GSR had them maroon usually, but again they tended to get quite tatty looking. A heavily weathered version in GSR Maroon it is then! I have ran out of castings for the handbrake wheels, but no shortage of end castings. I'll drop them a line and see what they have. Got some work done on the 6 wheeler. Ditto here - roof did not fit so a new was made and rain strips added. Sides were also short when the tumblehome was added so ends needed to be sanded down to settle the body on the frame. The gap between the body and base was then strengthened and filled with a 1mm angle. Cleminson chassis built and underframe completed. 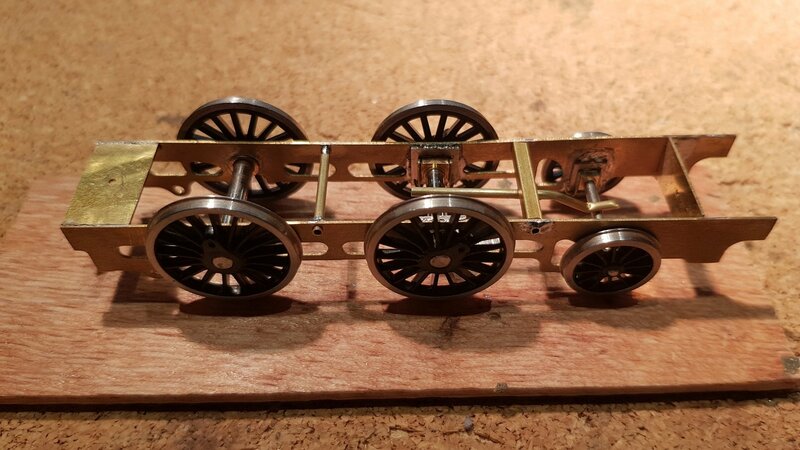 Not the best chassis it has to be said, W irons were too far apart, even for 21mm gauge and required some tweaking to get right - it also seems to leave the ride height a bit high, and this is with 12mm wheels instead of the required 14mm wheel. There is no compensation, however the side play in the axles will probably be enough. I will leave it for now, but may look at re-doing the chassis if it gives problems. Even with said comments, it is developing into a nice coach. Brakes and a bit more detailing to the underframe to be completed and then off to the paint shop. Interior to be completed once painting is done. I took of the W irons and moved them in to the correct width. 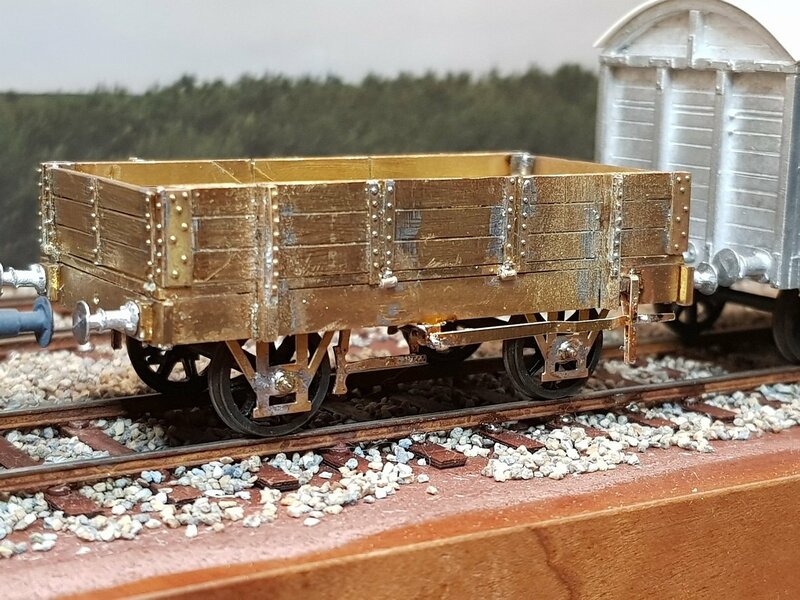 I rather like the look of the SL&NC Road Vehicle Wagon, and having some 1mm brass sheet, I decided to have a go at creating one. Drawing created of the wagon, which allowed a cut drawing be produced which was then cut out on the CNC. Really tough stuff, and many broken bits, trimming and sanding later we ended up with some reasonable parts. 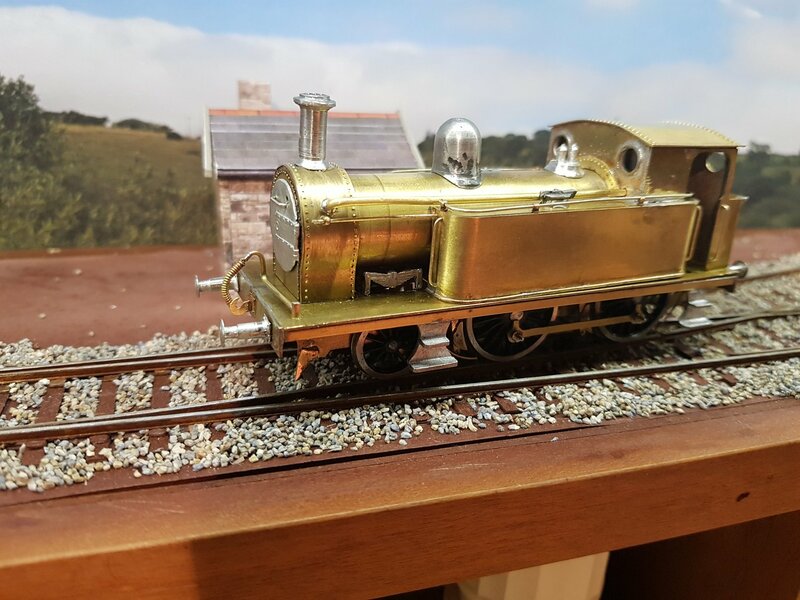 I bougth the 1mm some time ago thinking I would use it for loco frames, but 0.5mm is more than enough and closer in scale so this was surplus - I won't be buying it again as it is difficult to work with, both cutting & soldering. 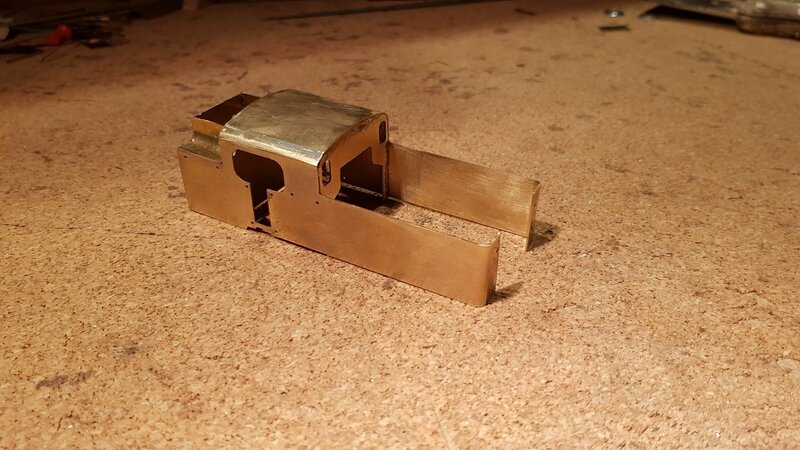 Floor, buffer beams and solebars/frames assembled. Sides are created from individual planks cut out, which is probably over the top, but will provide good detail. These were then assembled with some uprights and strapping added c/w rivet detail for the opening door section. The uprights were then used to fix the sides to the frames. This wagon is a little unusual in that the sides line up with the frames with no overhang. The sides were originally designed to be removed thus they lined up with the frames and slotted into straps on the frame. Wagon with Austin 7 Van purchased at the show last Sunday. Some more strapping needed for the uprights, springs, axleboxes, draw hook and coupling system to be added to finish it off. A good cleanup is also needed ot get rid of excess solder, marks, etc before we get to painting. 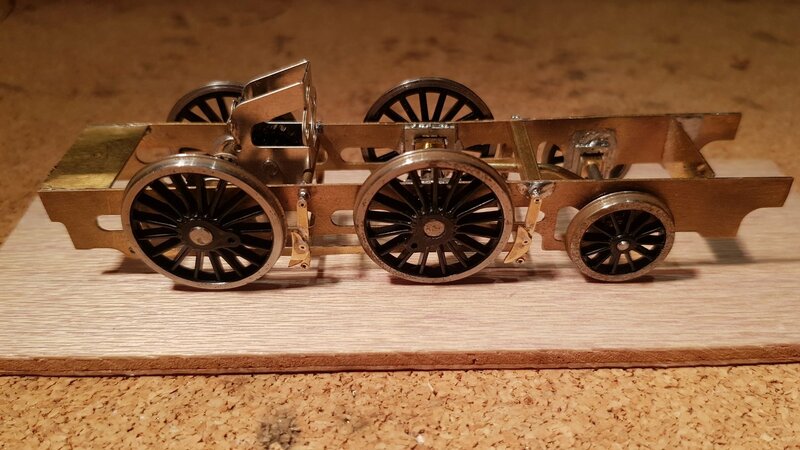 I also decided to assemble an SSM open wagon kit I have had for some time now. 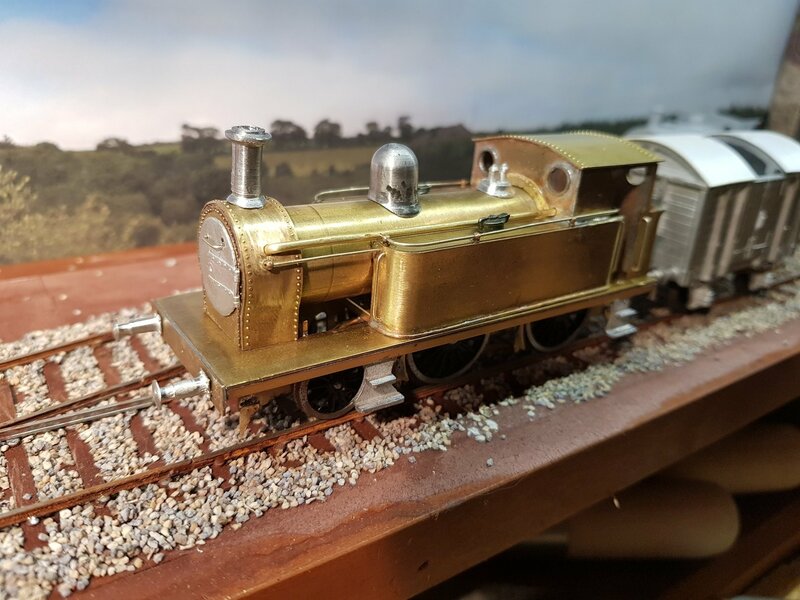 Whitemetal is a very different material to work with, but the kit went together rather well. Again SSM compensated W-irons and brake detail added - this needs to be completed as the lever is not shaped, so will need to come off again and lever guides to be added. Nice wagon and a hefty weight. Final detailing such as drawhook, coupling system, tidying up and into paint. All tolled, we are getting some nice rolling stock together. Numbering gone onto the loco, so final coats of varnish needed plus some weathering to finish off. 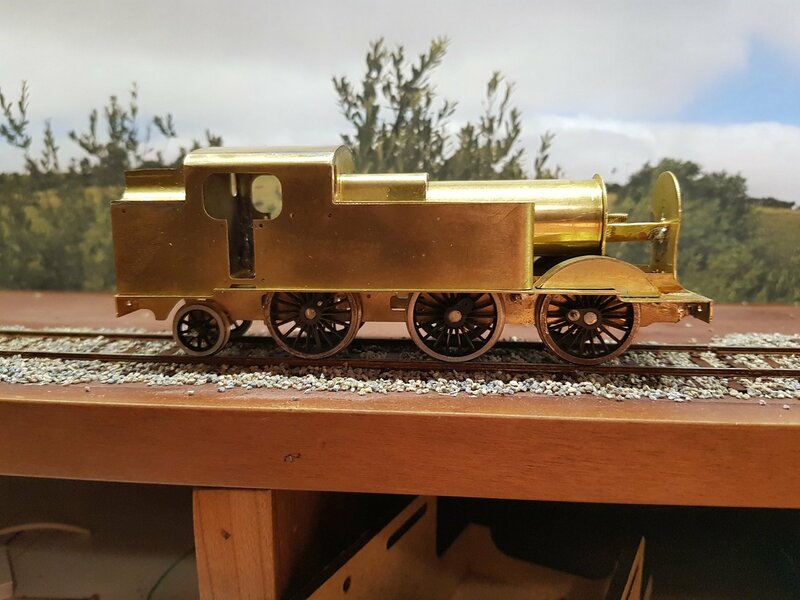 Wow that’s a great result for scratch built brass. How did you do the super looking rivets?